The Gobbledy Gooker: I remember the hype leading up to the 1990 Survivor Series. A giant egg, and the teases as to what or who was inside. Finally, Thanksgiving night the egg hatched just in time for the Pay Per View. Reaction wasn't good to the costumed bird, who was played by Hector Guerrero. He danced with "Mean" Gene Okerlund and ran into the ring, hit the ropes, and did some flips. He and Gene did some more dancing while Gorilla Monsoon and "Rowdy" Roddy Piper did their best to sell what we were seeing. At one point Gorilla called the winged wonder "a hit with fans." Umm, Gorilla, with all do respect, give me a break. The bird brain made a few appearances on WWF TV over the next few months before seemingly flying into extinction. I don't remember him actually wrestling. Did he? Actually, I don't think the Gooker was as bad as others did. Sure, it was a huge let down. I'm not sure what fans were expecting. I don't even remember what I expected. Heck, that was 20 years ago. Hard to believe, right? Not long after the hatching, the Gooker was history. That is until 2001 and Wrestlemania 17, where the most infamous turkey participated in the gimmick battle royal. As you can see, the costume is different, but the man behind it is still Hector Guerrero. Eleven years later, the crowd was a bit more receptive to the festive fowl. 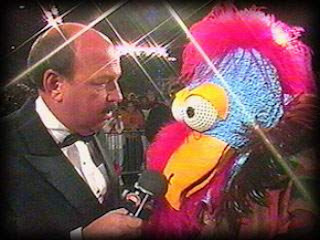 Gooker wouldn't last long in the battle royal. In fact he's was the second man (or bird) tossed over the top rope. But even after that elimination, the bird would rise again, almost like a phoenix. This time though, the role of the turkey was the diva Maryse. She donned the feathers, beak, and wobbler and served as a special guest time keeper for a six diva tag team match around Thanksgiving. It was all a ruse though, as the bird that's usually preyed upon, became a bird of prey. Maryse, still in disguise attacked Melina. She assaulted her with the head of the costume and event threatened the "King" Jerry Lawler when he tried to help. And don't forget how much trouble she had shedding the feathers and big yellow feet. That was pretty comedic too. I like the fact that they bring back old gimmicks like that from time to time. I never really had any beef (pardon the pun) with the turkey, but I know a lot of fans have called it the worst gimmick of all time. Personally, I'd take the Gooker over the Red Rooster any day. And now he's officially a member of the WWE Alumni on WWE.com. Note all images come from the WWE.